Remember when Kanye did his Pablo thing on SNL? As with other Pablo-related things, drama came up in the 11th hour, according to a report from Page Six. Anonymous sources told the New York Post that the live-sketch show’s stage setup prompted a Kanye outburst, one that entailed the rapper almost bailing moments before he was supposed to go live. “There were a few really tense minutes [backstage],” one source explained, noting that Kim — in the audience with Kylie Jenner — had to help Lorne Michaels and Co. mollify the rapper. “He freaked out about how the set was arranged. He was saying he’s ‘the greatest artist,’” another added. 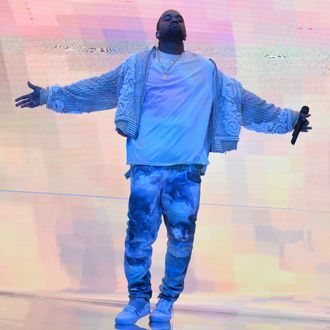 “He’s under a lot of stress between the new album and the fashion line.” Ultimately, of course, Yeezy stayed and performed. So, to be fair, Ye is also critical of Ye.